Radical Waters, the leaders in Electrochemically Activated Water (ECA) solutions have signed a distribution agreement with Chlorking, US manufacturers of on-site mixed oxidant ECA and chlorine generating systems, and plan to offer the technology to the South African, European, UAE and South American markets. “Reliability of ECA generator systems is a critical factor for our customers”, says David Friedland, Director at Radical Waters International. “We are looking into ways to improve continuously. The Chlorking devices are solid, easy to install and require very little maintenance. It’s a win-win situation”. The partnership will also allow Radical Waters to harness the strength and reliability of plate technology and access to markets where there have previously been limitations with the coaxial reactors, commonly used in food and beverage applications. Based on the same principals of Electrochemical Activation of Water, Radical Waters is excited to partner with Chlorking to bring ECA to the water treatment market. The NEW-GEN Mixed oxidant generators offer the ECA method of sanitizing various bodies of water, but with the capacity to treat larger volumes. The generators are available in many sizes and configurations to suite any application. ECA’s standard raw materials being that of salt, electricity and water, combined with the unique plate cells produce a variety of solutions for your facility. The pH Neutral ECA – is produced with a pH of 7 – 7.5, free chlorine of 500 – 700ppm and an ORP of 950mv, this solution is used in potable water treatment, bio-film removal in circulation piping and bacteria removal in storage tanks. 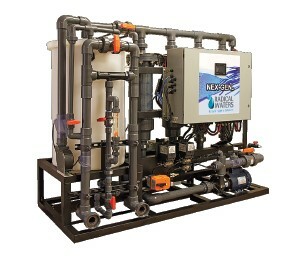 The NEX-GEN Chlorine Generator systems are a revolutionary design that allows for the pool water to be the source for Chlorine production with no need for fresh or softened water. Furthermore the systems are self -monitoring and only add chlorine as needed. With fuel costs continuing to rise and bulk storage of chlorine becoming an ever increasing problem; many pool operators are seeking safer, more cost effective solutions for the sanitization of commercial swimming pools. On-site production of chlorine as a solution of sodium hypochlorite alleviates those unnecessary risks and puts an end to ever increasing chlorine prices and storage issues. On-site chlorine generation is not a new concept at all, but what sets the NEX-GEN apart from other chlorine generators is the system’s ability to use the pool water as the source water without having to add salt to the pool, and the TDS control ability to maintain a maximum TDS based on the facilities requirements. Another benefit of NEX-GEN is that it is able to produce pH Neutral Chlorine, this means that the chlorine being produced in the production tank is maintained at 7.5 ph (7.0 – 8.0 is user adjustable), assisting the pool to control its pH. Radical Waters will supply both the Mixed Oxidant and Chlorine Generator systems to the market. “This partnership continues our long term goal of bringing our technologies to international markets, and will further strengthen our position in both the recreational and water treatment markets” said Steve Pearce, Executive vice president of Chlorking, Inc.